What's happened to the Summer? With feet in concrete, ribbed wings braced against wind. stretched necks at the size of you, coppered, blazing in the sun. bosses and salt skinned shipmen, women who wailed at the sea. Tellin' them that we ain't done yet. your head towers with the rest of you, chained, fearless in the rain. Lasses and leather skinned wives, kids who don't cry in a fight. Yellin' through the rain, soaking wet. History call to travellers, passing on the ancient road. God voiced through the strength of you, challenging, shining in the dark. They're sellin' the message, all of them. Children and those not born, boys who run with forever. Sellin' diamonds of courage from the old old hills. Sellin' all the truth they can get. You're human, feet in the clay, head in clouds. Toward the bronzed light of you, watching, lighting up the world. Warriors and sleeping peacemakers, lovers who cry at the dawn. Tellin' peace that we all can get. 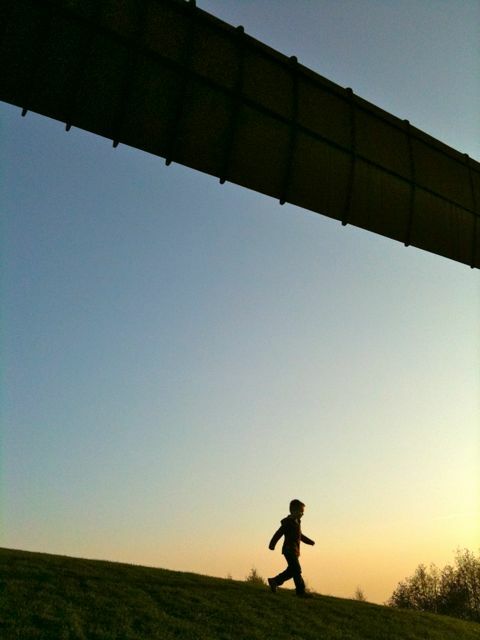 I married the Angel of the North. no church aisle could content it. no cutting a three-tiered cake. But I said to the Angel, "I do"
and the Angel said "I do", too. can't move its muscular legs to clasp me. and I can't tell if it has breasts. mooning and spooning and making daisy chains. this moment should last forever. I know the Angel lives on its small hilltop. and the Angel will never leave me. Other people may marry the Angel as well. This causes me no problems. hear its wings sing the wind. its face turned away from memory. or men welded to a tanker's hull. through all our northern weins.